Q: What is Potomac Distribution? Potomac Distribution is a retail/wholesale online mail order company. We have been an industry leader in the collectibles market since 1990, and have a loyal, worldwide, customer base. We offer our customers competitive prices on factory sealed boxes and cases of collectible card games, sports and non-sports trading cards, collectible miniatures and board games, as well as the accessories and supplies that accompany all of these products. We take pride in the level of friendly, quality customer service we offer, and enjoy a high positive feedback rating with our Ebay store. We work hard to ship our customers' orders as quickly as possible, and offer FREE shipping on all orders of $195 or more shipping inside the continental U.S. For orders shipping outside of the U.S. and to Hawaii and Alaska, we offer deeply discounted shipping rates through various private companies as well as the U.S. Postal Service. We pack all orders carefully and double-box all case orders. Q: How long has your company been doing business? Potomac Distribution has been in business since 1990. We also maintain an Ebay store, having been an Ebay seller since 1998, and we urge you to check our feedback rating and history at ebay.com. We pride ourselves on the level of customer service we offer. We are also a verified Paypal merchant. Q: What steps do you take to ensure that the items I order arrive to me in good condition? At Potomac Distribution, we understand that one of the biggest frustrations of online ordering is receiving products that have been damaged during shipping. We take great care in stocking our warehouse with undamaged, sealed boxes and cases, and we package orders carefully using quality materials, including double boxing cases, specially wrapping delicate items such as collector's tins, and shipping single cards in protective sleeves and storage boxes. We order our products from a wide variety of sources and always look for the best possible deal. We also maintain a low profit margin on all of our products. Q: Where can I find your most recent prices? We update our web site every weeknight with our latest prices. You can also click here to sign up for monthly or weekly email updates . Q: Do you sell single cards? With some rare exceptions, we only sell factory sealed boxes and cases. Most of the single cards that we do have available are case topper or case incentive cards. You can find those cards listed here. Yes! Please click here for information on how to purchase a gift certificate from us. Q: I am a retailer. Do you have wholesale prices for stores? We are a retail/wholesale company, and we offer one set of discounted prices to all of our customers. However, we occasionally offer special prices on certain products to approved retail stores. These special offers are stated clearly under the product information, when available. Yes! We offer a 4% discount for orders of $1000.00 or more in merchandise (shipping costs and sales tax do not count towards this amount). Please Note:The 4% discount only applies to regularly priced boxes. It does not apply to case prices or special price quotes. So, if your order exceeds $1000.00 and contains a case, you will receive either the 4% discount off of our regular box price for that product or you will receive the case price for the item - whichever price is lower. Q: I am looking for a product that does not appear in your store, what can I do? Click here to reach our "Restock e-mails for sold out or upcoming products" page, and follow the instructions. You can also email us at sales@potomacdist.com to see if we can special-order the product that you are looking for. Q: How does your discounted damaged items list work? If you would like to order from our damaged items inventory, you will find these items under the corresponding product listing, including the reduced price. When ordering damaged boxes, please be sure to let us know in the comments section of the order form whether you would like to receive an undamaged box in the event that the damaged box you order is no longer available. We recommend that you read carefully the information on our Damaged Box Pricelist. Please note that each item code represents one damaged item. All damaged items are sold as is. Q: I have placed an order with both in-stock and pre-sale items on it. Can you split my order and send me the in-stock items now? If your order contains both in-stock and pre-sale items, we will hold your entire order until all pre-sale items are available. We would be happy to split your order into two shipments, but please note that this may increase your total shipping costs as it is more expensive for us to ship two packages rather than one. We will let you know what your new shipping costs will be before we ship any part of your order. Q: When I place an order for a pre-sale item, when is payment due? We require a deposit of 10% for all orders containing pre-sale items when the order is placed. If you are paying by credit card, the remaining balance (90%) will then be charged when we ship your order. If you are paying by PayPal, we will send a payment request to you through PayPal for the remaining balance (90%) a day or two before your order is expected to ship. Please Note: Customers placing pre-orders who choose to pay using Google Checkout will be charged 100% up front. Q: Can I cancel pre-ordered items? If you need to cancel an order containing pre-sale items, we will keep any deposit that you have paid towards the order. In the event that a pre-sale item is canceled by the manufacturer, we will promptly refund all deposit payments. Q: Will the information that I submit with my order be kept secure? Q: How do I open an account number with Potomac Distribution? You will automatically be assigned an account number once you place your first order. You will not need an account number until you place an order with us. Q: How can I get my password for your website? Once you have your account number, go to My Order History and submit your account number under "Don't know your password?" If you do not know your account number, please call us at 1-703-661-6946, or toll free at 1-800-259-4424, Mon-Fri 10:00 AM - 5:00 PM EST. Q: What can I use my account number and password for? You can use your account number and password to view your order history. When you include your account number with your order, it helps us to match your order with your existing account. Q: Why doesn't my account information show up automatically when I enter my account number on the online order form? Due to the fact that our customers' account information often changes, we feel that it is best that you enter your information manually in order to prevent any discrepancies, as well as for your own security. Q: Do you buy products from your customers? We are happy to consider any offers you might have for your factory sealed boxes and cases. Please understand that, as we do not stock many individual cards or packs, we are generally not as interested in purchasing them. Please contact us at buyer@potomacdist.com with your offers. We accept Visa, MasterCard, Discover, American Express, JCB, Paypal, and Google Checkout. We also accept C.O.D. orders, payable upon receipt by cashier's check or money order, for which there is an additional $9.95 C.O.D. charge. Payment can also be mailed to us in the form of a check or money order. If you choose to pay by personal check, please note that we must wait 21 days for the check to clear before shipping your order. If you pay by money order, we will ship your order as soon as we have received payment. Please make all checks and money orders payable to Potomac Distribution, LLC. Finally, we accept payment by bank transfer for all orders above $1000.00. Q: What is a billing address? The billing address is the address where you receive statements from your bank or credit card company. This address can, in some cases, be different from the shipping address. If you aren't sure of your billing address, please contact your bank or credit card company. We require a verifiable billing adress for all credit card transactions before shipping an order. Please note that your order may be delayed if we receive incorrect information. Q: What is a CVV number? The CVV number, also known as a CVC or CID number, is a security code located on your credit card that ensures that anyone using your card for online transactions actually possesses the physical card and not just the account number and expiration date. If you are using Visa, MasterCard or Discover, the CVV number is a three-digit code located on the back of the card on the signature strip, usually preceded by the last four digits of your account number. If you are using American Express, the number is a four-digit code imprinted on the front of the card in the lower left-hand corner. We will be unable to process your order without this important piece of information. Q: Do I have to pay sales tax on my orders? Our warehouse is located in the State of Virginia, and all customers located in Virginia must pay 5% sales tax on all orders. We are not required to collect sales tax if you are located elsewhere in the U.S. If you are an international customer, please read our International FAQ with regards to import duties and taxes. Q: How long will it take for my order to arrive to me? We will ship your order to you as quickly as possible. 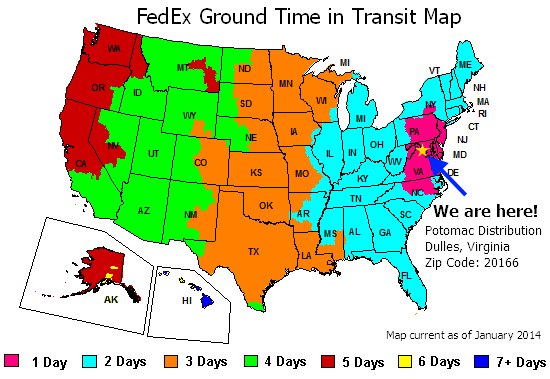 Please see our FedEx Ground delivery time map for shipping times to your state. Q: My order did not arrive in the expected time period, yet when I track my package it shows that it has been delivered. What should I do? Please contact us by phone at 1-800-259-4424 (toll free) or 1-703-661-6946 or by email at sales@potomacdist.com. We will contact the shipping company and start an investigation and driver follow-up. Q: Can you ship orders to P.O. Boxes? If you need your order shipped to a Post Office Box, please contact us by phone at 1-800-259-4424 (toll free) or 1-703-661-6946 or by email at sales@potomacdist.com. Q: I would like to ship my order to a friend or relative at a different location than my normal shipping address. How can I do this? Please provide us with all of the pertinent shipping information as usual, including the recipient's name and any special instructions. Be sure to submit the appropriate billing address if you are paying with a credit card. Q: What time of day can I expect my package to be delivered? For residential addresses within the continental U.S., delivery times can vary widely and can be as late as 7:00 PM. Delivery times can often be earlier for non-residential deliveries. Q: I don't expect to be home when my package is delivered. What can I do about this? We recommend that you have your package shipped to an alternate location where you expect to be, such as your workplace. If this is not possible, we recommend that you contact the shipping company with any special delivery instructions. We cannot be held responsible if your package is lost or stolen due to any special instructions given to the shipping company. Q: I received my order, but there is a mistake with the items that were sent to me. What can I do? While we do our best to prevent such mistakes from happening, regrettably they sometimes do. Please contact us as soon as possible by phone at 1-800-259-4424 (toll free) or 1-703-661-6946, or by email at sales@potomacdist.com if you feel that we have made any kind of mistake. We can send you a replacement item and issue a return label for the erroneous merchandise. We ask that you please keep the shipping box and all packing materials until the matter is resolved. Q: I received my order, but some of the items were damaged. What can I do? Again, we work hard to ensure that the items you order are shipped to you in good condition. However, it is possible that merchandise can get damaged during transit. Please contact us if you feel that the items you received are not in good condition, and we will work with you to resolve the matter. We ask that you please keep the shipping box and all packing materials, as the shipping company may need to examine them. Q: What can I expect to pay in duties and taxes when my package arrives? Duties and taxes vary by country. For member states of the European Union, you can expect to pay approximately 25% to 35% of the order total, including shipping costs. For other countries, we recommend that you contact your local customs office prior to ordering to obtain the necessary information. Q: How do I pay any duties and taxes owed? Payment of duties and taxes is the responsibility of the recipient. The shipping company you choose will broker your package and pay the necessary import taxes for you when the package arrives to your country. The shipping company will then present you with an invoice that is payable upon delivery of your order. Q: Can you mark my package as a gift? We are unable to mark your package as a gift for customs purposes. We are required by U.S. law to provide three signed and dated copies of your invoice to U.S. Customs that must accurately reflect the contents of the shipment. Q: Your prices are in U.S. dollars. How can I find out what the cost is in my own currency? Due to the fact that currencies fluctuate daily, we are unable to quote prices other than in U.S. Dollars. We recommend that you contact your bank for current exchange rates. Q: How can I find out what my shipping costs will be without placing an order? Once all items on your order are available and we have received payment, we usually ship your order within one business day. The transit time varies depending on the type of shipping you choose. Most shipping companies can deliver your package within 2 to 5 business days. Q: What is dimensional or volumetric weight? Dimensional weight, or volumetric weight, is used by shipping companies to calculate shipping costs for large but lightweight packages. For packages like this, shipping companies will charge us based on the size rather than the weight of the package. Some, but not many, of our products are subject to dimensional weight. We have noted this next to the weight of the product on the product's information page. All products that are subject to dimensional weight have listed weights that end in .495 (for example, 1.495 lbs, 2.495 lbs, etc). These numbers are the dimensional weights based on the size of the item and not the actual weight of the item. We try to minimize the shipping costs for packages that include items with dimensional weight. For these orders, it is possible that the final shipping charge on your invoice will be slightly less than the amount that is calculated by our website. It is difficult for a computer to accurately calculate the correct shipping charge when dimensional weight is involved. Therefore, we will manually recalculate the shipping charge if we feel we can save our customers money. If you have questions about this topic or would like us to manually calculate shipping costs for an order which includes dimensional weight items, please don't hesitate to contact us.